4 Why choose Paddy Power? 11.1 What is in-play betting? 20.1 1. How to place a free bet? 20.2 2. How do I verify my age? 20.3 3. What happens if I have forgotten all my login details? 20.4 4. Does Paddy Power place a charge on debit/credit card transactions? 20.5 5. Will I be charged for using the Cash Card PPlus? 20.6 6. How do I use the cash out offer? 20.7 7. I’ve won! What happens next? 20.8 8. How can I see my transaction history? 20.9 9. How can I change my card number? 20.10 10. Why is my card not being accepted? €20 Free bet bonus on signup There are a wide variety of bets to choose! Paddy Power is one of the largest names in the sports betting scene and has been operating since 1988. With hundreds of land-based betting shops across Ireland and the UK, plus a global presence online, Paddy Power have become one of the world’s most successful gaming operators. Paddypower.com is one of the top bookmakers for Irish bettors. They have an impressive range of betting options available on all sports as well as frequent money-back promotions. The sign up offer is a €20 risk free first bet. You get your money back should if you bet loses. That’s not all, you also get a VIP Club weekly €10 Free Bet when you opt into the loyalty VIP Club. They have a dedicated mobile app, live streams and in-play betting with some of the best odds around. In our BettingTop10 review, you’ll find all the information you need on how to bet at Paddypower. How to claim it Click on the ‘Open an Account’ button located in the top left-hand corner of the homepage. It will open an online form with the bonus code already inserted. This promo is for available for new customers. Only deposits by credit card or Paypal are eligible. Valid for the sportsbook only (excludes lotteries or totepool betting). If you’re a footie fanatic one of the best Paddy Power promos is the Hotshot Jackpot. All you have to do is pick the first goalscorer in six selected matches in each round of the Premier League and Champions League 2017/18 season. If you accurately predict the goalscorers for ALL selected matches then you stand to win €100,000. Sticking with football, this offer gives you a full payout if your chosen team is winning by 2 goals at any point, even if they later go on to draw or lose. This offer applies to Premier League, La Liga and Champions League games until the end of February 2018. If you bet on football regularly, then why not opt in for the rewards promo and earn Paddy Power free bets as you go? Simply place 5 bets of €10 across any sport, Monday – Sunday and you’ll receive a free bet worth €10 every week . Claiming your first bonus with Paddy Power is super simple. First, register for an account. Check out our ‘How to Open an Account’ section below for full details. The process will only take a few minutes, and on completion you’ll be asked to make your first deposit. Just beware that deposits by Skrill or Neteller are not eligible for the Paddy Power free bets. Make a deposit with a minimum value of €10 by credit/debit card or Paypal and then place a bet of up to €10 on any sporting market. Then sit back and relax, because even if you lose, you’ll get your cash back. Paddypower is a great choice for sports betting in Ireland and when you read our list of pros below you’ll see why. €20 Risk Free First Bet + Weekly €10 Free Bet. Live streaming for all members. Impressive range of betting options on all sporting events. Huge range of deposit and withdrawal options. Deposits using Neteller or Skrill can’t claim sign-up bonus. Maximum bet limits can be applied to accounts that win big frequently. The Irish bookmaker has made a name for itself by offering customers one of the best list of sporting markets, with some of the most competitive odds. But, the real star of the Paddy Power show is their ‘money-back’ promotions, which offer real value and no risk to bettors. That’s not all, as you can also find multiple promotions all year round on all of their sporting markets. With literally hundreds of betting types available, punters are in betting heaven. With so many betting sites to choose from, it can seem an impossible task to separate the good from the bad. We take a look at what makes Paddy Power stand out from the crowd. Paddy Power are one of the biggest gambling operator in Ireland, but with an Isle of Man license, they are able to accept bets from key locations around the world. Founded in 1988, they have been pulling in the punters for 30 years, and have dominated the online scene since 2000, the same year the company was floated on the London stock exchange. They now employ over 2,570 people in Ireland and 5,000 worldwide across their different Paddy Power brands. The sports offering from Paddy Power is operated by OpenBet, one of the most reliable bookmaking software providers out there. It is used by pretty much every major operator in the industry. The robust and reliable software ensures fast loading times and transitions between pages. Paddy Power holds a number of gambling licences which allows them to offer their wide range of products and services to a global customer base. They are officially licensed by the UK Gambling Commission, Alderney Gambling Control Commission, the Malta Gaming Authority, the Italian Agenzia delle Dogane e dei Monopoli and in Greece by the Hellenic Gaming Commission. Paddy Power is one of the largest online bookmakers. The website has a green and white interface and is very easy to navigate, with everything you need clearly displayed. They also have a mobile app which is perfect for betting on the go. It is available for all mobile operating systems including Apple’s iPhone and iPad and can be downloaded from the App Store. It is also available on the Google Play store for Android users. All the latest promo codes are displayed in a navigation bar at the bottom of the mobile app too so you never miss out on a great deal or free bet. Paddypower offers about 40 different sports markets. Football is their most popular, with horse racing coming a close second. They offer all the national sports for UK and Ireland, plus a wide range of International markets. If you’re looking for something a little more niche, then you’ll also find markets for rowing, fishing, weightlifting and the increasingly popular, eSports. They also have markets for events, politics, celebrity and novelty bets. Specialty markets for TV series such as the X Factor are also included. In-play betting is excellent and you can stream events live with live odds available. You can wager on most sports events including American football, athletics, baseball, basketball, beach soccer, beach volleyball, boxing, cricket, cycling, darts, football, GAA, golf, greyhounds, handball, hockey, horse racing, ice hockey, motor racing, rugby league, rugby union, snooker, tennis, MMA and volleyball. As previously mentioned, Paddy Power provide a comprehensive list of sporting markets, ranging from the most popular to the niche and to the down right random. Since it is Ireland’s very own sportsbook, it is no surprise that Paddy Power provides the best odds for the country’s favourite sports, including GAA Sports, Football, Golf, Rugby and Horse Racing. Paddy Power is number one when it comes to offering markets for Gaelic Games. They cover pretty much every GAA Football and GAA Hurling match taking place and customers can take their pick from about 30- 40 markets for each one. From match winner, to a huge range of handicap markets and many more. Your typical Premier League football match has about 60 different betting categories, meaning hundreds of individual bet types. Football markets include numerous pre-match markets, traditional markets, plus a wide selection of Alternative Handicaps, First Goalscorer, Number of Team Goals, and Winning Margin to name but a few. Paddy Power golf coverage includes all the major Tours, offering more each-way places than any other online sportsbook. Golf punters can choose from around 37 markets, which include top 5, top 10 and top 20 finishes, to make/miss the cut, top lefty and Big Guns v The Field. Paddy Power go beyond the homegrown rugby markets to also include European Cup competitions, French leagues, English leagues, Sevens competitions and more niche markets from around the world. Paddy Power also offer handicap betting options and total points. If you like to bet on the go, then Paddy Power mobile app will keep you in the loop. The mobile app is available to download on iOS and Android, but if you don’t want to download you can also access the site through your mobile’s web browser. The website is fully mobile responsive and provides the same easy, user-friendly betting experience as the desktop version. On top of that you also have access to all the same sports markets and odds. Use the A-Z search function to find the market you wish to bet on. Simply tap the event from the list and the markets available will be displayed. Tap on the market, then the outcome you wish to back and then enter your stake amount and confirm. 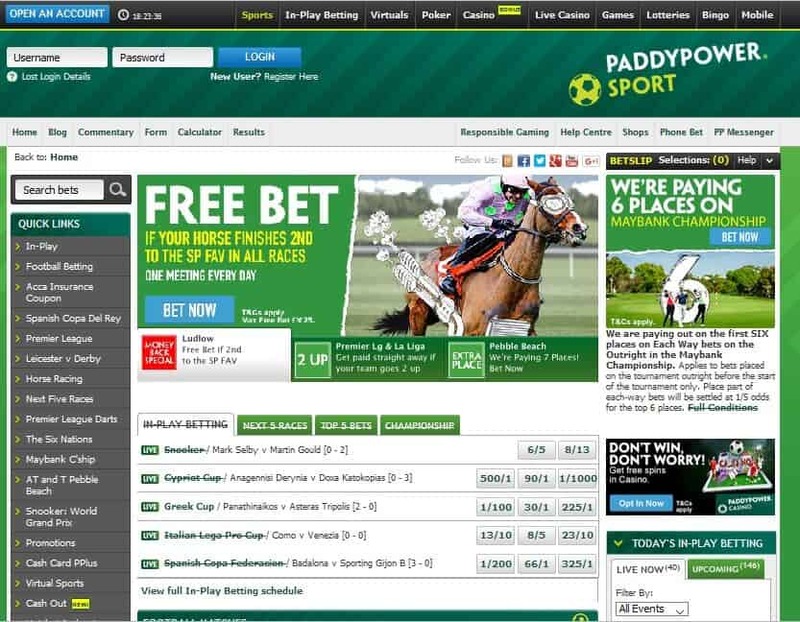 You can access all the same Paddy Power promotions as are available on the desktop version. Simply click on the promotions tab and choose the offer. Head to Paddy Power Android app page and you’ll be taken directly to the Google Play store. Click on Settings & Security to turn on Unknown Sources which will your phone to install the app. You’ll get a notification for PP-Sports, click to install. Apple users can visit the iTunes Store and do a quick search for the Paddy Power app. Click download and the installation will commence. 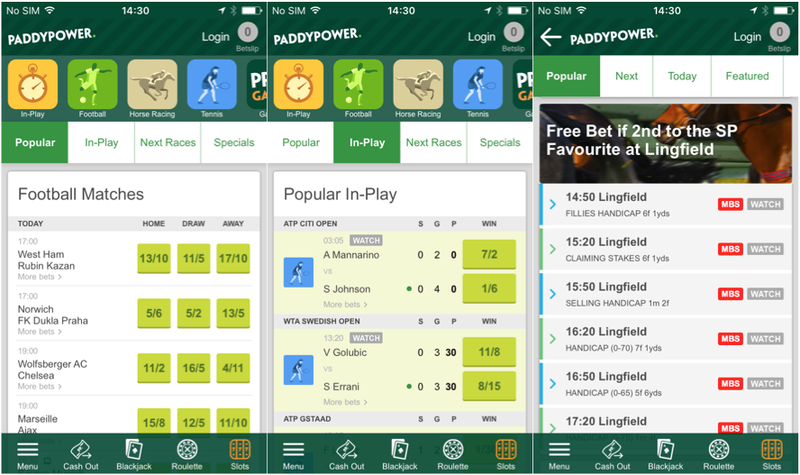 While the mobile app is free to download, to access Paddy Power’s live-streaming feature you must have funds in your Paddy Power account, and for horse races you’ll also be required to place a minimum bet on the race you wish to watch. If you meet those requirements, you can tune into a whole host of UK and Irish races, plus European football and international events. Funding your Paddy Power account via your mobile is simple, and you can deposit using most of the same methods as you’d find on the desktop. You can take your pick from the a number of credit/debit cards, e-Wallets and even bank transfer. A full list of payment services can be found below. If you want to know how much you’re set to win before you place a bet, you can head to the Paddy Power calculator. There is a little slider to display odds in decimal or fractional. Enter the odds offered, pick the result and then enter your stake amount and bet type and the calculator will automatically show the amount you are set to win. Treble– one bet on three selection, all of which must be successful to get a return. Trixie – four bets on three selections in different events, two or more selections must be successful to get a return. Patent – seven bets of three selections in different events, one or more selections must be successful to get a return. The In-Play platform is excellent and bettors can choose from a number of sports including football, tennis, snooker, horse racing, handball, European ice hockey, virtuals, and mini games. In the top menu for this section you’ll find links to the form, calculator, blog, commentary, results, and watch live sections. The Live Betting calendar is on the left-hand side of the screen with the live streaming section on the right. The live streaming section shows what matches are streaming right now and under this you will find the betting slip. In the middle is all the events that are currently taking place. Click on any sporting event to see the odds and markets that are available. When you click into the game the live streaming section to your right allows you to watch the live stream or the pitch view. The middle of the screen displays all the odds and the markets with the top markets displayed at the top with the odds changing as the game is played out. In-play betting is placing a bet after the event has started, while the sport is ‘in-play’. The advantage with this type of betting is that you can react to events as they happen. You may have had a favourite before the match, but perhaps your chosen team doesn’t seem to be on form, so you can change your bet in-play, and bet as many times as you like. Paddy Power offers more than most online sportsbooks. They have a number of special and additional products and features to make your online experience a unique one. You’ll be asked for your name and username or email address, and to answer your security question in order to place your bet. Telephone bets can then be checked online after the call. Paddy Power offer customers a prepaid MasterCard which is linked to their Paddy Power account. The card can be used to withdraw cash from ATMs or at in-shop paypoints. The money comes directly off your Paddy Power account balance instead of your bank. Onside is a Paddy Power app which acts like an extension of the bricks and mortar betting shops. Now, you no longer have to stick around in the shop to keep track of your bets. Instead, just download the Onside app and take the shop with you. You can follow all the match or race action, live stream and cash out, all while on the move. This product from Paddy Power allows you to lock in a profit or loss before waiting for an event to finish. Paddy Power calculates the value of your current bets in real time based on the live market prices. PaddyPower betting in Ireland is provided by a number of different software developers. The site offers live in-play betting, mobile racebooks, mobile sportsbooks and more using Bettorlogic, Inspired Gaming, and OpenBet software that is licensed in Malta and the United Kingdom. All betting can be done online through your browser and there are dedicated apps available for mobile users. Bettorlogic offers a number of different solutions with their software including Easibet, livelogic, multibet, and Nextbet. Each of these platforms has their own advantages and helps create the amazing sportsbook that PaddyPower offers. Livelogic gives live bet prompts at regular intervals based on the current match situation. Nextbet is for recommendations. Inspired gaming is used for the virtual sports section. The games are ultra-realistic and are compatible with desktop and mobile gaming. OpenBet is the main software provider and is the world’s leading omin-channel sportsbook product available today. The software is able to meet the high demands of bettors today and can offer any type of sport even and betting market around the world. It is the most powerful sportsbetting software on the market and includes live betting as a core functionality. All bet types are supported with an extensive range of market types. The software also integrates with all major sports feeds, video streaming, and information services. Deposits and withdrawals are available in Euro and Pounds Sterling. There are a large number of options available including credit and debit cards, as well as popular e-wallets like Neteller and Skrill. Bear in mind, that players who deposit using Neteller or Skrill cannot claim the sign up offer. PayPal is also accepted and is credited instantly to your account. Bank transfers can take between 1 and 5 days. Withdrawals are fast and all e-wallet cashouts are processed in just 4 hours. Credit and debit cards can take 2-3 business days. Making a deposit at PaddyPower is quick and easy and below you will find our step by step instructions. Step 1: Log in to your account and visit the My Account section. Step 3: Follow the specific instructions for your chosen payment method. You can choose from debit/credit card, bank transfer, Neteller, PayPal, PaySafeCard, or Skrill. You will need to register your chosen deposit method before proceeding to step 4. Step 4: For debit/credit card, the minimum deposit amount is €5 and you can instantly fund your account via mobile and desktop. You will be asked to enter your deposit amount, CV2 number, and your account password. Step 5: Click on Deposit now and your transaction will be completed. Step 1: Log into the Paddy Power app and tap your account balance. Step 3: Follow the specific instructions for your chosen payment method. Step 4: Enter the amount you wish to deposit and click Deposit. Paddy Power live streaming feature is available for the most popular sports such as football, tennis, basketball, and horse racing. As mentioned above, live streaming is free for some events, but may have betting conditions for others. To access the streaming option you must have funds in your account first, and in case of the horse racing, you must place a bet on the event to be able to watch it. Then you can click the live-streaming icon and catch the action live. You’ll also need to have Flash, Windows XP or higher, and a broadband speed of 512 KBps or higher. Live-streaming is also available via the Paddy Power mobile app. We have more details on the mobile app below. If you love to play the slots or fancy a game of Baccarat or Blackjack then Paddy Power Casino is the place to be. They have over 130 slot games, dozens of video poker games, plus a huge variety of card and table game. As part of their casino offering Paddy Power has a live casino feature to give customers the full Vegas experience from the comfort of your own home. Enjoy the atmosphere of the live dealers on Baccarat, Blackjack, and Roulette. The Poker option allows you to play with other players online, and includes a live chat feature so that you can enjoy a bit of banter as your play. They also offer poker tournaments. The fun never stops at Paddy Power with sites dedicated to every sort of online game you can think of. You can take you pick from a wide variety of novelty online games and themed bingo games and lotteries. Paddy Power offer live-streaming for a number of sporting events and horse racing. Some live streams can be access daily and for free when logged in to your Paddy Power account. Others may require customers to make a minimum bet in order to view. Navigating the world of online sports betting can get a little confusing, but with our comprehensive guide it’ll be a breeze. We have everything you need to know about Paddy Power’s different sporting markets, bettings types, how to open and fund your account, all of the banking options and an in-depth look at the mobile app. Plus, we give you all the nuts and bolts of how to get the most from your Paddy Power account. The Paddy Power sign up process is very simple and can be completed in just a few minutes by following just 3 steps. Click the on the blue ‘Join Now’ button located in the top right-hand corner. You’ll be redirected to a online registration form and prompted to fill in a few personal details, such as full name, DOB and addresses. You’ll also choose your username and password which you’ll need to access your account later. Submit the form when ready. You’ll receive a confirmation email with a link to confirm your account. That’s it. You’re now ready to make your first deposit. Probably the most popular payment method for Paddy Power customers. All major cards accepted, with instant deposits and fast withdrawal times. Available via desktop only, bank transfers take about 1-5 days for both deposits and withdrawals. Before making your first bank transfer withdrawal, customers must provide Paddy Power’s security team with a copy of a bank statement and photo ID. Neteller is one of the fastest e-payment systems and so is a favourite for the serious punter. Transactions take between 1-4 hours to process, and allows for low minimum deposits. Available on both desktop and mobile, Paypal is fast, secure and also allows low minimum deposits. Transactions, deposits or withdrawals made via Paypal can be processed within 4 hours. The PaySafeCard is accepted for Paddy Power deposits made via the desktop only, and are processed immediately. If you have chosen to deposit with the PaySafeCard, you can withdraw your winnings from your account by Bank Transfer. Immediate deposits and withdrawals processed with 1-4 hours, Skrill and Moneybookers are a safe, secure and timely payment method for funding your Paddy Power account. You have a two options open to you to make a deposit to your Paddy Power account, Quick Deposit (using the primary card payment method you have chosen) or from the payments section and select a method. When you are logged in to the site you will see a ‘Deposit’ button located in the top right hand corner next to your balance. Click on the ‘Deposit’ button. A pop-up will appear showing your primary card payment method. Enter your CV2 number, the amount and click ‘Deposit’ to confirm. This same pop-up window also includes a drop down menu so that you can easily choose another card that you have registered with your account. You can also select ‘Add new card’ from the same menu. At the bottom of this pop-up window you can also click ‘Deposit funds page’. Click on this to go to the payment section to deposit by any of the other methods. If you’ve just had a win and fancy making a withdrawal to bank those winnings, we explain below how to process a withdrawal in a few quick and easy steps. Withdrawals usually take between 2-5 working days to reach your bank account. Bear in mind that weekends and bank holidays are not working days, so if you withdraw at these times, it will take a little longer. When logged into your account your account balance will be displayed in the upper right-hand corner of the homepage. Click the small arrow next to the balance to see the full info. Click ‘Withdraw’ located next to the main wallet details. On the withdraw funds screen simply choose the method you’d like to use using the navigation bar. Once you’ve selected the method you’d like to use, enter the amount and then click ‘withdraw’. 1. How to place a free bet? When you’ve selected your odds, click on ‘Betslip’ found in the right hand corner of your screen. The Betslip will pop up showing your bet. Enter your stake and toggle the ‘Use available Free Bets’ slider. Then place your bet by clicking on ‘Place Bets’. As part of their robust security system, Paddy Power require customers to verify their ID and age. To confirm you are over 18 years of age you will have to send one piece of photo ID, either a copy of your Passport, Driver Licence or National ID card. You can do this by logging in and clicking on ‘My Account ‘ button, click ‘Confirm Your Identity’ when prompted and follow the onscreen instructions. 3. What happens if I have forgotten all my login details? In this case you should contact the Paddy Power Customer Service Team via the live chat or phone. 4. Does Paddy Power place a charge on debit/credit card transactions? Paddy Power doesn’t charge for credit/debit card transactions, however check with your bank to enquire about charges on their end. 5. Will I be charged for using the Cash Card PPlus? There are no charges or fees for using the Paddy Power Cash Card. However, there is a 1% commission on Foreign Exchange transactions. 6. How do I use the cash out offer? If you have any outstanding bets eligible for cash out, you’ll see a number next to the ‘Cash out’ tab in the top right hand corner of the homepage. Click on it, and a drop down list with eligible bets will appear. Select the bet you’d wish to cash out and click the blue ‘Cash out’ button to immediately receive the cash, or you also choose to have a partial cash out by clicking the green ‘slider’ next to the ‘Cash out’ button. 7. I’ve won! What happens next? Paddy Power aim to settle bets within an hour for their most popular markets. You can check your settled bets by selecting ‘My Bets’ option from the header of the homepage. 8. How can I see my transaction history? Log in to your Paddy Power account and select ‘My Account’ located in the top right hand corner of the page, and then ‘My Account’ from the drop down menu. Selecting ‘Betting Activity’ from the navigation bar at the top of the page will open a drop down menu where you can select ‘Transaction History’. 9. How can I change my card number? Login and click on My Account, then select ‘Payment Types’ and click on ‘Add Payment Type’. Then enter your new card number, deposit amount, expiry date and then the 3-digit CV2 number located on the back of the card. Enter your password and click ‘Save Details And Deposit’. 10. Why is my card not being accepted? There may be a few different reasons for your card not being accepted. For example, Paddy Power are unable to accept prepaid cards, or cards which are issued from banks in restricted countries. In certain cases you may be requested to send a scan or photo of the front of the card and a bank statement for verification. Customer support is excellent and there is a FAQs page, payment info page, and more on the website. Support is available 24/7 via their website www.paddypower.com and there are several ways to get help. You must be logged in to access the live chat feature. We found the website help section very useful and the support team was courteous in all their correspondence. It’s easy to see why Paddy Power is a firm favourite the world over. Customers have everything they could ever want from an online bookmaker. They have an excellent choice of sporting markets and odds, from the most popular to the more niche markets. Plus, with one account you can also enjoy the other Paddy Power products, such as casino, poker and online games. The website is simple to navigate and user friendly. Transactions are simple, quick and secure, with lots of options for both deposits and withdrawals. The one thing that sets the Irish giant ahead of the game is the brand’s sense of humour and social media presence, which makes for a unique and fun online betting experience. What are you waiting for? Join in the craic, and open an account today!